On February 5th, followers of the Chinese zodiac calendar will bid farewell to the Year of the Dog and usher in the Year of the Pig. Celebrations will continue until February 19th, closing with the Lantern Festival. The pig ranks last in the hierarchy of the animal zodiac because he was late to the party when the Jade Emperor created the celestial calendar. Some versions of this legend claim that a wolf destroyed the pig’s house in a tale similar to that of the Three Little Pigs, though some versions have the pig simply oversleeping. The pig felt obliged to rebuild his house before coming to the party, and this captures one of the key personality traits of those born under the sign of the pig: they are appreciative of the good things in life, but willing to work hard to get them. Pigs in China are potent symbols of wealth and good fortune, and those born under this sign are said to be gregarious and easy going, effortlessly achieving positions of power and influence. The beginning of the Year of the Pig will see many mainland Chinese to set out across the vast country to return to their families of origin. 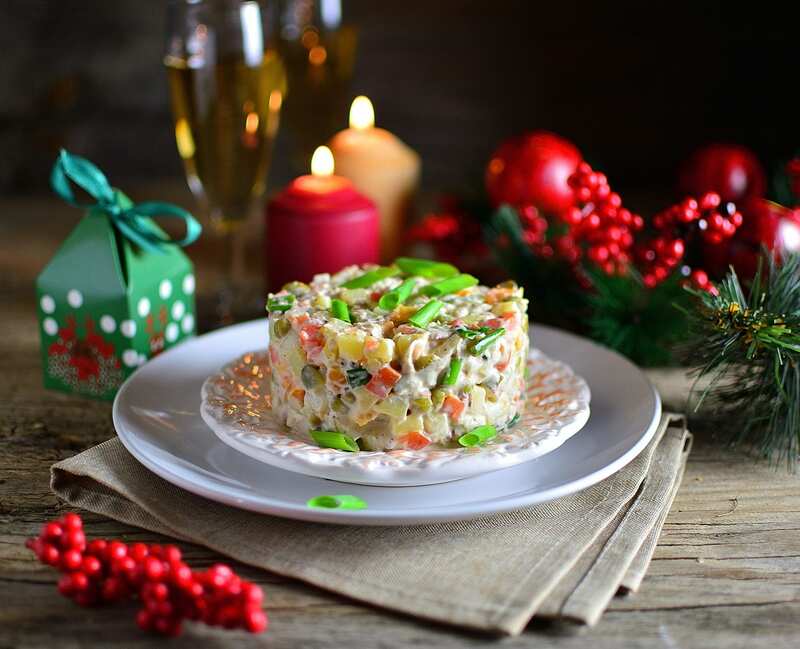 This is a joyful season of celebration, reunion, and, of course feasting with traditional dishes, imbued with thousands of years of symbolic significance. Dumplings are popular, not only because assembling them is often a family-all-together event, but also because they resemble gold and silver ingots, and thus bring wealth and prosperity in the New Year. Whole roasted chickens and stuffed fish represent family togetherness, while tangerines and oranges (the Chinese words for these fruits sound very like “luck” and “wealth”) appear at almost every meal. Noodle history is almost as old as the history of mankind. Long strands of pasta in Asia represent longevity and are served at birthday celebrations just as candles are put in Western birthday cakes. It’s no wonder that they take pride of place at New Year’s for their length, which symbolize both a long journey, which most Chinese are obliged to make at this time of year as well as the all-important longevity. 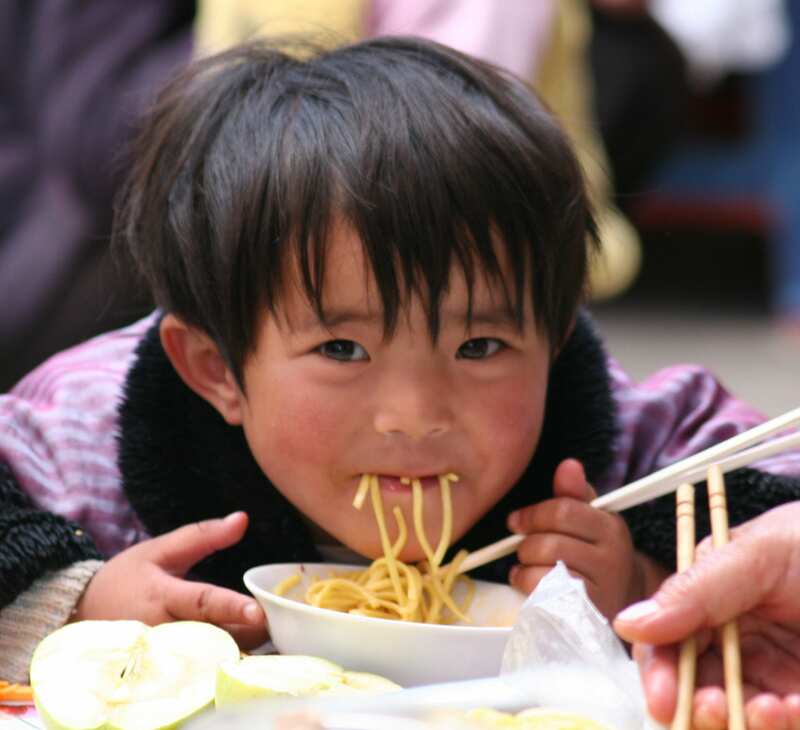 Great care is taken throughout the New Year season to ensure that any noodles are long and remain uncut or torn. Ramen noodles are so much more than cheap midnight fodder for college students. Made from wheat-based flour and egg, they are chewy, and absorbent often served with broth or thick sauce. A true ramen bowl is a delicate balance of flavors and textures with nary a flavor sachet in sight. Soba refers to any thin Japanese noodle, but the most common are made from buckwheat flour, which makes them popular with the gluten-free crowd. Buckwheat’s many health benefits make soba noodles a popular base in Western health food restaurants for noodle/grain bowls or chilled noodle and vegetable salads. Udon noodles are wheat-based udon noodles are thick, chewy and very satisfying! They are most often encountered swimming in bowls of spicy broth topped with shredded meat, chopped vegetables, and spicy oil. 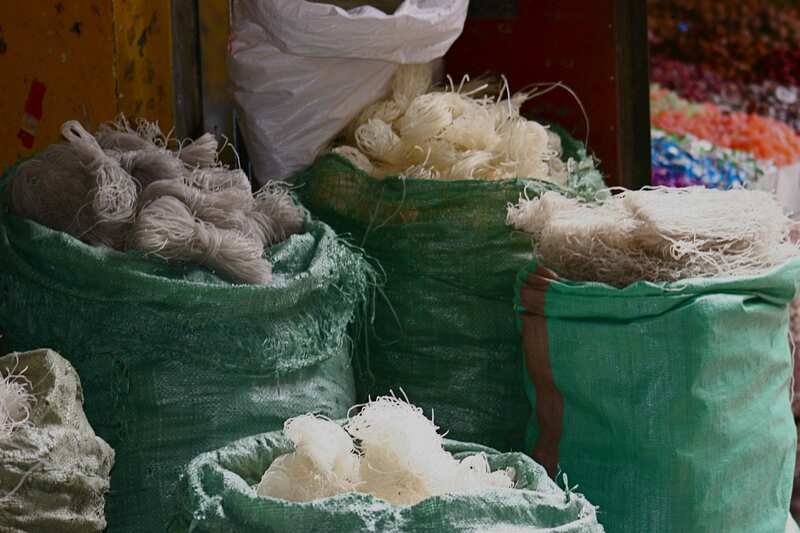 Rice Noodles come in varying sizes from thin vermicelli to wide rice noodles. They are more delicate than their wheat-based counterparts but easier to cook since they require only a short soak in hot water to activate. Rice noodles are often added to stir-fry, pad thai, pho, Bahn-mi, and other Asian noodle dishes. 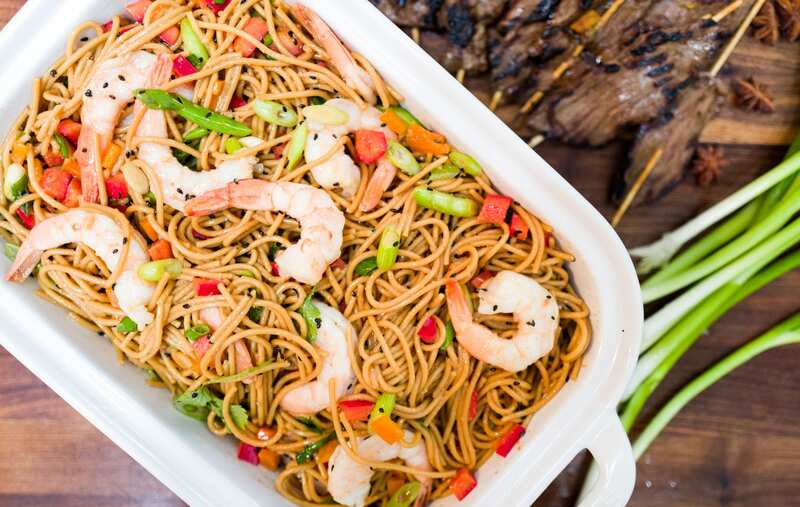 Longevity Noodles can form the basis of your own Spring Festival celebration at home. Easy to assemble, suitable to make ahead of time, redolent with the flavors and symbolism of Chinese New Year, with a pleasing ratio of effort to reward, these two recipes epitomize the happy-go-lucky spirit of the Year of the Pig. 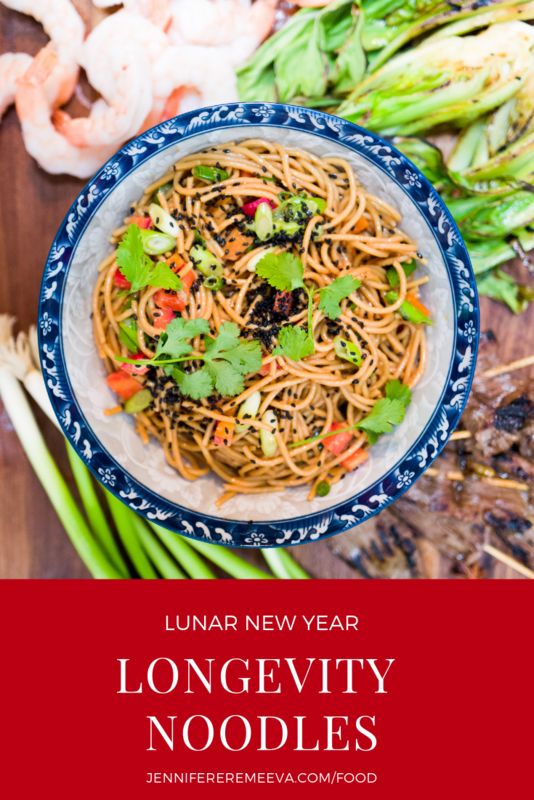 Longevity Noodles have long been a favorite in our family for their almost infinite flexibility; we make a large batch of the base recipe, then each person adds his or her favorite protein, vegetable, or herb toppings for carnivore, vegetarian, or even vegan options. Plain supermarket pasta works well for this recipe, allowing the noodles to soak up the dressing and become delightfully slippery. The dressing keeps for at least a week, so if you have family land in on you, you will be prepared! 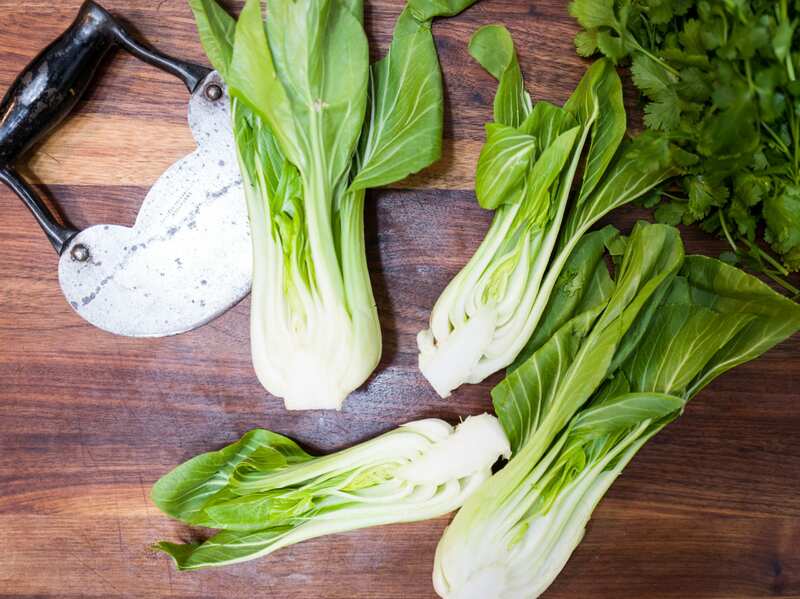 Vegetables: charred or raw bokchoired and yellow peppers, cucumbers, pea shoots, edamame, peas, radishes, baby corn, water chestnuts, bamboo shoots, or any micro greens. Herbs and other toppings: sliced scallions or chives, roasted peanuts or cashews, cilantro, or parsley. Combine all of the sauce ingredients in a non-reactive jar with a tight lid and shake vigorously to combine. Bring a large pot of cold water to a rolling boil. Add the pasta and cook according to package directions until al dente. Drain and return the noodles to the pot. Add half of the dressing and toss to combine. Cover loosely with a clean towel and set aside for at least 1 hour and up to 3. This is an important step: the pasta needs time to absorb the liquid dressing for this dish to work, so plan accordingly! Toast the sesame seeds in a clean skillet over medium heat until they begin to smoke. Remove from heat and let them cool down. Add to the noodles with half of the remaining dressing and toss again to combine. Set aside for at least 30 minutes. You can prepare the noodles a day in advance and refrigerate them once they have achieved room temperature. Just before you are ready to serve the noodles, add whatever you like from the Toppings Ingredients for the combination that most appeals to you! Add the remaining dressing if needed. *Debate rages in my family about the correct consistency and type of noodle. I vigorously defend using a thin spaghetti (#11 or #12) as I am convinced that angel hair is far too thin and linguine too flat to reach the desired consistency. While this recipe can work with soba or rice noodles, I find the best results are achieved using plain old supermarket pasta. To hone this recipe, I used Barilla, which does a great job in absorbing the dressing to create the desired slippery consistency.